The shareholders should log on to the e-voting website evotingindia.com. Members holding shares in Physical Form should enter Folio Number registered with the Company. Next enter the Image Verification as displayed and Click on Login. If you are holding shares in demat form and had logged on to evotingindia.com and voted on an earlier voting of any company, then your existing password is to be used. After entering these details appropriately, click on “SUBMIT” tab. Members holding shares in physical form will then directly reach the Company selection screen. 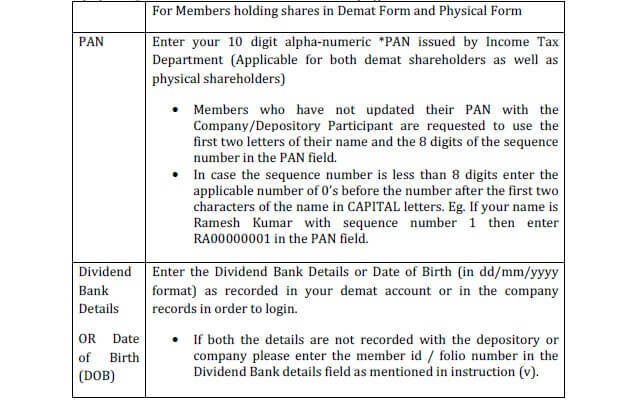 However, members holding shares in demat form will now reach ‘Password Creation’ menu wherein they are required to mandatorily enter their login password in the new password field. Kindly note that this password is to be also used by the demat holders for voting for resolutions of any other company on which they are eligible to vote, provided that company opts for e-voting through CDSL platform. It is strongly recommended not to share your password with any other person and take utmost care to keep your password confidential. For Members holding shares in physical form, the details can be used only for e-voting on the resolutions contained in this Notice. Click on the relevant EVSN of R J Bio-tech Limited on which you choose to vote. On the voting page, you will see “RESOLUTION DESCRIPTION” and against the same the option “YES/NO” for voting. Select the option YES or NO as desired. The option YES implies that you assent to the Resolution and option NO implies that you dissent to the Resolution. Click on the “RESOLUTIONS FILE LINK” if you wish to view the entire Resolution details. After selecting the resolution you have decided to vote on, click on “SUBMIT”. A confirmation box will be displayed. If you wish to confirm your vote, click on “OK”, else to change your vote, click on “CANCEL” and accordingly modify your vote. Once you “CONFIRM” your vote on the resolution, you will not be allowed to modify your vote. You can also take a print of the votes cast by clicking on “Click here to print” option on the Voting page. If a demat account holder has forgotten the login password then Enter the User ID and the image verification code and click on Forgot Password & enter the details as prompted by the system. Non-Individual shareholders (i.e. other than Individuals, HUF, NRI etc.) and Custodian are required to log on to evotingindia.com and register themselves as Corporates. A scanned copy of the Registration Form bearing the stamp and sign of the entity should be emailed to evoting@cdslindia.com. After receiving the login details a Compliance User should be created using the admin login and password. The Compliance User would be able to link the account(s) for which they wish to vote on. The list of accounts linked in the login should be mailed to helpdesk.evoting@cdslindia.com and on approval of the accounts they would be able to cast their vote. A scanned copy of the Board Resolution and Power of Attorney (POA) which they have issued in favour of the Custodian, if any, should be uploaded in PDF format in the system for the scrutinizer to verify the same. In case you have any queries or issues regarding e-voting, you may refer the Frequently Asked Questions (“FAQs”) and e-voting manual available at evotingindia.com, under help section or write an email to helpdesk.evoting@cdslindia.com. dematerialized form, as on the cut-off date (Record Date) of Friday, 22nd September, 2015, may cast their vote electronically. The e-voting module shall be disabled by CDSL for voting thereafter. (c) The voting rights of Members shall be in proportion to their shares in the paid-up equity share capital of the Company as on the cut-off date of 22nd September, 2015. Once the vote on a resolution is cast by the member, he/she shall not be allowed to change it subsequently. M/s. Nitin S. Sharma & Associates, Company Secretaries have been appointed as “the Scrutinizer” to scrutinize the e-voting process in a fair and transparent manner. The Scrutinizer shall, within a period not exceeding 3 (three) working days from the conclusion of the e-voting period, unblock the votes in the presence of at least 2 (two) witnesses not in the employment of the Company and make a Scrutinizer’s Report of the votes cast in favour or against, as the case may be, and submit the same to the Chairman of the Company. 10th Annual General Meeting of the Company to be held on Tuesday, 29th September, 2015 at 11.00 A.M. and shall be communicated to the stock exchanges, where the shares of the Company are listed.